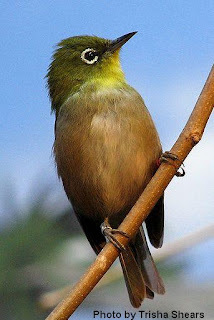 Jing-Tang Yang, Jian-Yuan Su, Shang-Chieh Ting, and Yu-Hung Chang , self-proclaimed bird-loving engineers , studied eight Japanese white-eyes - birds of the passerine order. They trained them to hover in a wind tunnel while filming them with high-speed cameras. The cameras tracked the birds’ centers of mass, their eyes and the tips of their tails and recorded the movements on a computer. Not all birds hover the same. Hummingbirds, for example, hover symmetrically. They flap their wings back and forth as though treading water, producing lift during both the upstroke and the down stroke of the wings. Passerines, however, hover asymmetrically: Their upstrokes and down strokes are different. If they were swimming, passerines would be doing something more like the butterfly stroke in place, generating lift solely on the down stroke. It was when taking a closer look at the mechanics of birds' hovering that the engineers saw something unique, a flight characteristic they hadn’t quite expected – a mechanical way of keeping the eyes steady. “A hovering passerine exploits a unique aerodynamic trick to facilitate stabilization during down stroke,” the authors say in their paper. To counteract the lack of lift during the upstroke, the down stroke produces enough lift to raise the bird’s whole body. As the bird rises, though, it also rotates, pivoting around the eye. The tail swings up and the head swings down with the eyes at the center of all the movement. The combined effects of the body lifting up and the rotation dropping the head keep the eyes nearly stationary. The way in which the bird generates lift seems to be the trick that makes it all possible. On the down stroke, a bird’s wings force air down. The air forced down by both wings combines to create an air jet centered below the bird, just behind its center of mass. This pushes the tail end of the bird up, creating rotation as well as lift. If the jet were centered further forward - at the center of mass - the whole bird would simply go up without any rotation. For the bird’s eyes, the two displacements (the lift up and the forward rotation) cancel each other out and the result is that the eyes stay in nearly the same place. Though this trick is useful for keeping the bird’s eyes stable, it cannot control the bird’s gaze because the eyes would still rotate around with the body. This is when the physiological mechanisms come into play, the nervous and musculoskeletal systems keeping the eyes steady. The two systems work together to keep the passerine’s eyes on the prize. Yang, a professor in the university’s Mechanical Engineering Department, said the engineers would like to “convert the wisdom of flying creatures to the design of engineering systems.” Birds, he said, can serve as bio-inspired motivation for the invention of flapping-wing aerial vehicles. Leif Ristroph, a New York University physicist focused on insect locomotion, said that finding a way to keep micro aerial vehicles stable is a current obstacle in the industry, an obstacle that this type of research might help to solve. “We think of stability as keeping the orientation of your aircraft the same,” Ristroph said. “Birds are thinking, ‘How do I keep my eyes still while I am flying?’” Animals, he said, typically find the most efficient way of doing things, taking advantage of the physics around them to do things the simplest way. The engineers did not look at the mechanics of how the birds’ eyes remain stable during the upstroke phase of hovering flight when the mechanics are not as apparent as in the down stroke. Yang said that taking a closer look at the mechanics of the upstroke would be a topic for future research. Yang and his colleagues are still studying their passerines and plan to reveal more on the mechanical characteristics of the bird’s flight, including ascending flight, sharp turning and high-lift production, soon. This research is due to appear in the APS journal Physical Review E.